Contemporary fictionists will tell you that there are no heroes and villains, only men and women doing what they think is right (subconsciously motivated by a traumatic experience during their formative years, which they, now in their supposedly mature, conscious state, will re-enact and manoeuvre into their desired end — your friendly psychoanalyst might add). Take elderly sisters Abby and Martha Brewster, who live together with their mentally challenged nephew, Teddy in a huge Brooklyn house. Inspiration hit them when not long ago, a Mr Midgely knocked on their door, asking for a place to stay. The man — old and without a family to call his own — found a refuge and incidentally his final resting place in the Brewster household, where he died of a heart attack. Teddy (convinced that he is President Teddy Roosevelt) concluded that Mr Midgely fell victim to Yellow Fever and immediately dug a grave for him in the lot. Abby and Martha Brewster, played by Joy Virata and Jay Valencia-Glorioso, respectively. "He sat dead in that chair looking so peaceful... [Martha and I] made up our minds then and there that if we could help other lonely men to that same peace — we would!" recalls Abby wistfully. With too many empty rooms and a cellar to boot, not to mention some skills in chemistry, Abby and Martha took it upon themselves to take these poor men out of their misery by giving them lodging, poison, and a burial complete with prayer services. All this, of course, comes as a shock to their other nephew, Mortimer, who discovers a cadaver by the window seat the day he visits his aunts: "You can't do things like that... it's not only against the law. It's wrong!" he pleads, enraged and flustered. "Mortimer, we don't try to stop you from doing things you like to do. I don't see why you should interfere with us," Abby snaps back. 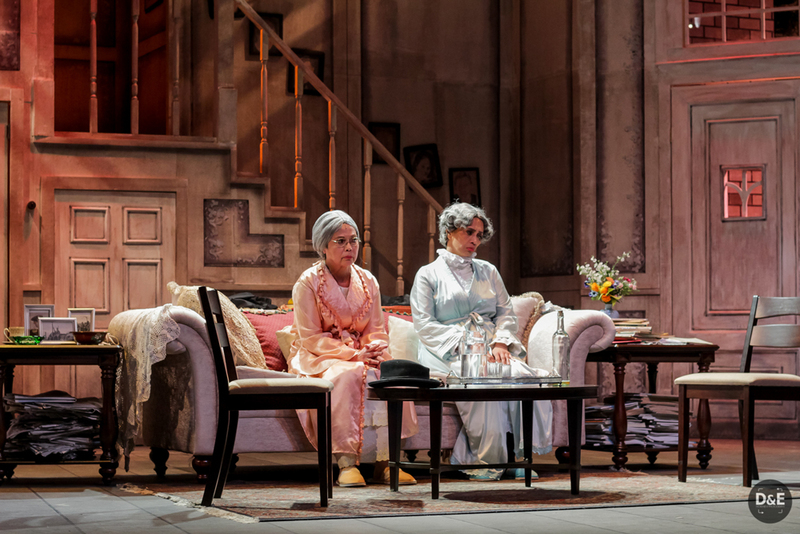 Repertory Philippines calls Arsenic and old lace by Joseph Kesselring a "legacy play", having been produced thrice in the theater company’s lifetime. The latest run (happening until the 29th at Onstage, Makati) is directed by Jamie Wilson and features Joy Virata (Abby Brewster), Jay Valencia-Glorioso (Martha Brewster) Nelsito Gomez (Mortimer Brewster), Jeremy Domingo (Teddy Brewster), and Apollo Abraham (Jonathan Brewster). It's easy to see its charm. The comedy has an un-clever quality about it. In contrast to modern shows, where the writing is too aware of its ingenuity, winking at the audience every chance it gets, Arsenic unfolds slowly to develop the plot as it extends a comic situation, thus allowing the audience to marinate in absurdity. Gomez is solid as Mortimer, who is at the center of the mayhem. Within a night, he proposes to his girlfriend, calls off the engagement, protects his aunts from being caught by authorities, and fights for his life, threatened to be taken away by his criminal brother, Jonathan (played with great command by Abraham). 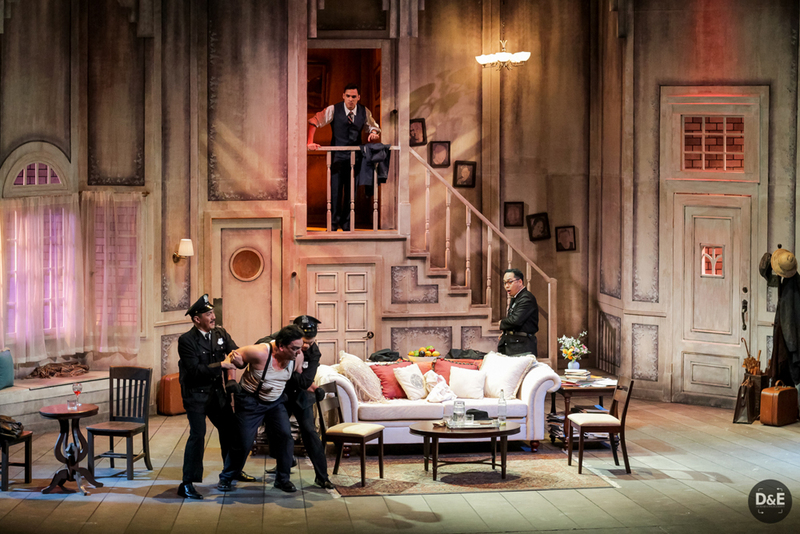 Repertory Philippines re-stages Arsenic and old lace by Joseph Kesselring. On the flip-side, spectators used to biting humor, quick-fire exchanges, and a sinister, cynical tone might find the play wanting. But it's not what it lacks story-wise that Rep's current staging of Arsenic suffers from. It's the disconnect among actors, from their roles and from each other. They can't quite bring us fully into their make-believe world. For a fairly large cast, they manage to make the stage feel cold. The playwright's well-orchestrated narrative (in three acts) registers as flat because of the tentative acting and because the direction is glad to settle with "cute and fun". Mortimer's questionable dedication to his family after learning he's not a Brewster after all, for example, has been lost in the interpretation. "Insanity runs in the family. It practically gallops," he tells his fiancé, Elaine, afraid that maybe it's not yet time to get married. But who's really insane — the ones who terminate another's pain, the one who's born out-of-touch with reality, the one who does bad and knows it, or the one who's happy to disown the people who have raised and loved him whenever it's convenient?